I wanted to see if you had upgraded your X2Pro to the latest 3.0.5 version from the App Store since you had this problem. Is everything working okay in the new upgraded version, and if you have not upgraded yet, can you do so and let us know how everything is running afterwards? Sorry - sent an email back but it must not have gone through... all is good... the other version worked for me no issues at all. Would be grateful if you could advise how you got on, have popped you another private mail but no response so a little concerned that the mails aren't getting through. Were you ever able to get to the 2.5.1 software information form James? If not, please let me know and I can provide it again. James has sent you an email. Please check the instructions in it. Yes! I need an AAF out today. Please send me 2.5 as soon as possible. Thank you. Dear Matt, I do apologise for the distress we are causing you, please understand we are doing all we can to resolve, however it is not proving easy to address and I am sad to say that I doubt that we will be able to resolve in a couple of days. I do appreciate you are under time constraints and the only options we have as a workaround at this moment is to roll you back to the previous version, as the Angus suggested. If you have Time Machine enabled you should be able to roll back quite quickly. If not then we will forward you a version of 2.5 that will run until we have resolved the issue in the current code. Assuming there isn't, I'd appreciate a refund. My hard drive is formatted: "Mac OS Extended (Journaled)"
Photo attached giving an example of how files are organized... Project ("Hospice")... each day w/audio folders... each "zoom" is a folder containing audio file. 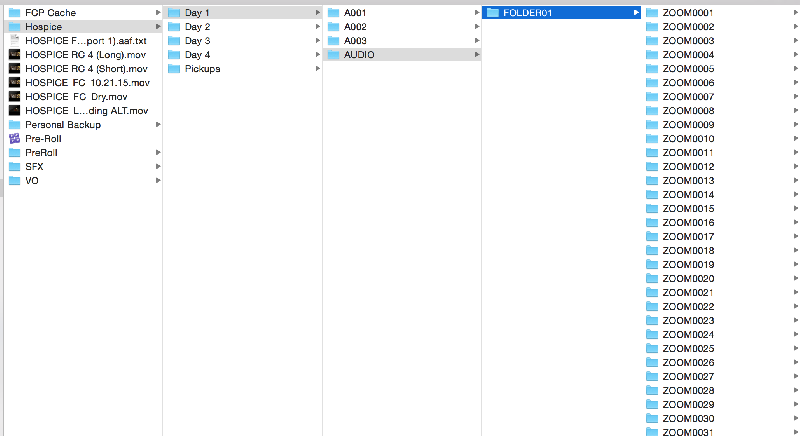 Additional media locations I added on top of each of the "day folders" were the "SFX" folder and the "VO" folder (obviously, SFX and VO files). I added Macintosh HD as you mentioned in addition to these, but that gave me the error message I copied previously. I also tried adding FCP Cache, then got this. Matt, what did you give a try? How is your Lacie Hard-drive formatted? Let me know how the media locations trick goes? Had the same error message in OS 10.9.5 with version 3.0.2 and had to back down to version 2.5.1 to get the AAF out for TX. I was thinking that the issue might of been .caf effects files that FCPX is referencing locally but they did into come up at all as being an issue. Do you have any media locations set in the X2Pro preferences? Can you remove any media locations that you may have set, then add your main system drive (normally called "Macintosh HD") as the only entry in the media locations list and try converting your project again?